Have you ever wanted to create a custom video to promote an affiliate product or business opportunity but struggled with it so much that you gave up? Well, join the club. You’re not alone. There’s no doubt that videos sell. What you need is a step by step guide that teaches you how to script and structure your video the right way the first time and every time. What to say, what not to say, how to get your viewers attention and keep it, and how to make them pull their credit card out as if they were commanded to do so. 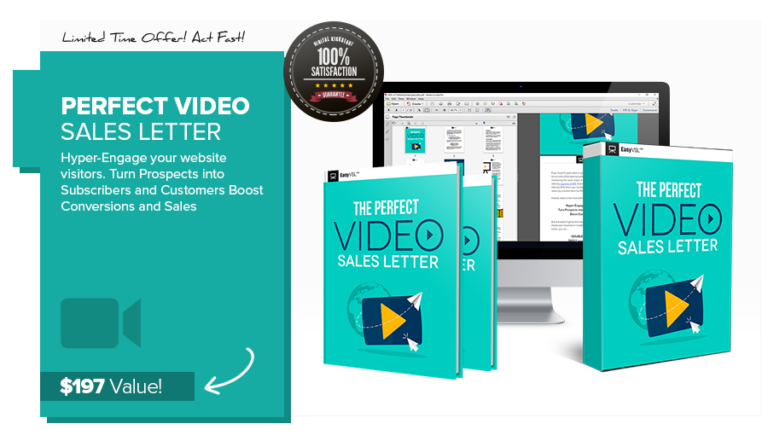 In this eBook, we’ll walk you through the perfect video sales letter and guide you through a simple, copy/paste, 10-step formula that allows you to crank out high-converting video sales letters easily and quickly. The best part here is that you don’t need to be an expert copywriter with lots of extra time and money. You’ll see a potential 5-10x increase in conversions overnight by simply using what you learn here to script and create a psychologically compelling and commission-pulling video sales letter. It’s as simple as that! There are 2 ways to download this PDF eBook. Method 1: Click on the Download button. The PDF file will open in a new browser window or tab. Look for the download button, which is normally in the upper right corner. Click on that button and save the PDF file to your computer. Method 2: Right-Click on the Download button. In the popup menu, select Save Link As and save the PDF file to your computer. Success! Keep an eye out for emails from Master Marketer. I search long and hard every month to find that one product that I know will help you make more money as an Internet Marketer. Don’t miss any of my Master Marketer Freebie of the Month deals. Enter your contact information on the left and I will notify you when the new monthly freebie is available for download.